Guitar Amp from Studio Devil will turn your iPhone, iPod Touch or iPad into a Tube amp complete with built in effects. To use this app, you need a headphone or a line out adapter plugged into the headphones jack AND a guitar input adapter like the Amplitube iRig, Apogee JAM, Peavey AmpKit, and other iOS compatible guitar interface. With Guitar Amp for iOS, you can select from three different amp styles and three different amplifier speaker cabinets. Available tones range from classic clean (GREEN amp), to British Crunch (YELLOW amp), and on to high gain Modern Lead (RED amp). If the many presets are not enough you can tweak the gain, level, bass, and treble knob controls to get your desired tone. 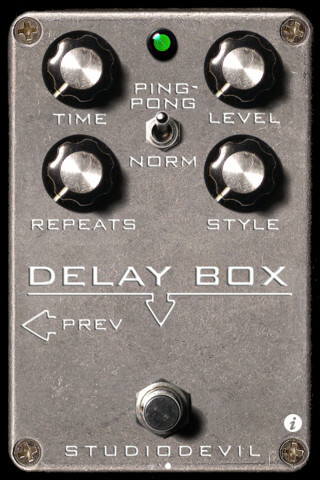 Guitar Amp now includes the Delay Box, an echo modeler / delay pedal effect which lets you add echo to your tone for spacious leads. It features delay, repeats, level, and style controls. This echo modeler lets you dial in a wide variety of tone: tape echo effects, digital delay, analog bucket brigade and anywhere in between!